My baby boy started kindergarten today. The boy who made me a mama. I don't want to close my eyes for too long, I don't want to wish one day away because these past five years have been a blink. It's cliche, it's old news. But, it's true, it's true, it's true. This time is fleeting and I'm gonna hold onto each day, each moment, each age, with each of my babies. He did so well. He's been asking every day if he could go to kindergarten. I blinked back tears when he hung onto my legs as we waited in the line for all the other kindergarteners. And then I was the only mom that walked back to the classroom with the kids. Yep, I'm that mom. Not afraid to claim it. I was sipping mimosas in Seattle when all the other moms brought their kids supplies in the week before. So that's my excuse to walk my baby back. I had to carry all those supplies. Duh. He was ready to face the world, or full day kindergarten, which is pretty much the same thing. 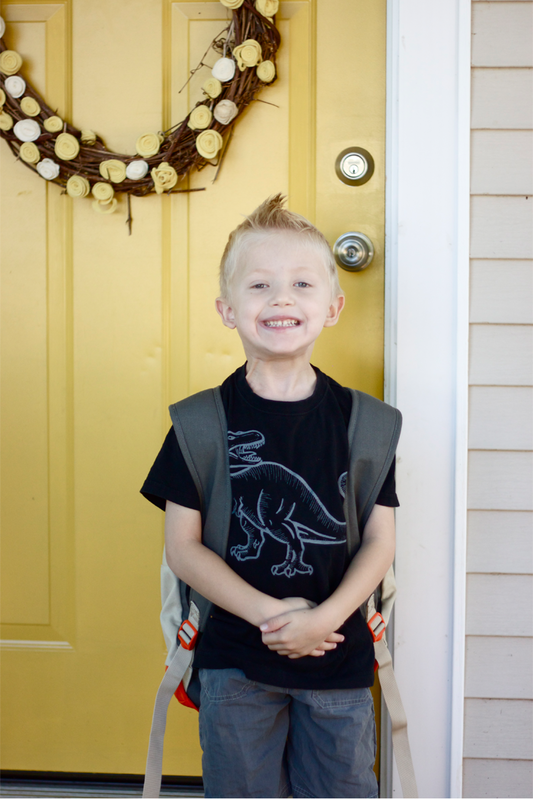 He rocked his favorite dino t-shirt, converse, and his spiky little faux hawk. As bittersweet as it was to have my baby gone all day, I have such a peace, and excitement for him as he starts this journey. omgosh! he's soo adorable! glad that he is loving it! so crazy he is so big already! oh girl. my heart. 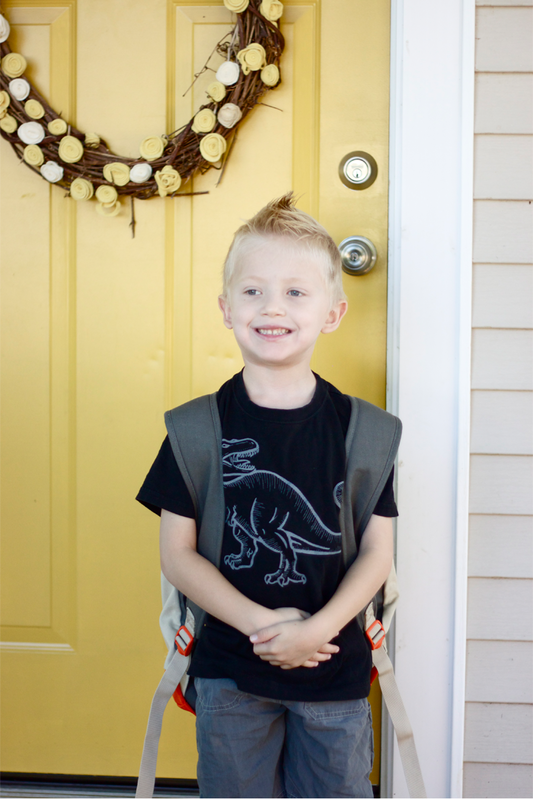 he is such a dude with that spiky hair and dino shirt! we will be there next year and it really does fly by. sayin' a little prayer this morning for you guys as you embark on this new journey. and i am totally that mom that walks here kid into the class room. all about the school supplies, obviously. i also happen to be the mom bawling in the parking lot. love you. Oh, this is precious. And heartbreaking. Just the realization of how quickly time passes and how before I know it my little four month old baby boy with be a big kindergartner. It's so tough on the heart to be a mama sometimes, isn't it? my chest literally felt heavy as i imagined him hanging onto your legs. and you walking back to his classroom. i will absolutely one hundred percent be that mom. and also the one who gets into the car in the parking lot and sobs. i could do it now just imagining it. his shirt! his hair! his excitement! such a sweet little stud. i will totally be the same way with my little dude. i tell myself everyday, must.stop.blinking. Oh Man. My oldest started Kindergarten last week and I wish I had such peace about it! It's not even full day :/ My girl could not love it more, though. To our babies (raising coffee mug)!! !